School Fundraiser With Gary Flegal. AND PROFITS YOUR SCHOOL UP TO $1000!!! Make your next Family Fun Night both Fun AND Profitable! Your PTA can raise funds by sponsoring my award-winning magic show! There is absolutely no up-front cost and the PTA makes money simply by offering reasonably priced tickets. The PTA keeps ½ of the ticket sales, plus 100% of concessions, while having a truly special family fun night. CLICK HERE for a more detailed Proposal. The show usually attracts 200-400 people depending on the size of the school. This translates into a $500 – $1000 profit for your PTA simply by offering a wonderful program at a very reasonable price – all before you’ve even sold one water bottle! The funds raised are just the beginning. Kids and adults witness mind-bending illusions, hilarious comedy, and incredible audience participation for less than the cost of a movie. TO ADD YOUR SCHOOL TO THE TOUR simply contact me with your school’s location and a few dates that would work for you – Gary@TheMagicOfSmiles.com or (615)812-7280. Gary takes care of everything. You pay nothing AND get 50% of ticket sales! 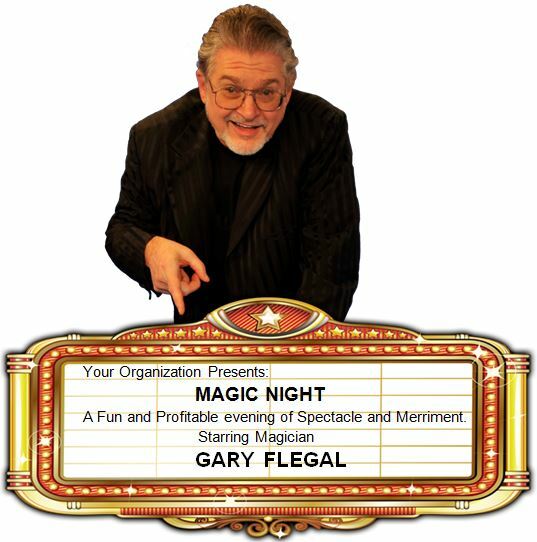 Have a Fundraiser with Gary Flegal at Your School! Are there any upfront costs? Nope! There are no upfront costs at all. You handle ticket sales, and my 50% of ticket sales is not due until the end of the show. Is there a minimum/maximum amount of people? There is no minimum. The average sized school draws about 250-350 people. For audiences of over 600 people it’s better to split it into two shows. Do you design the flyers/ticket forms? Yes – I design and customize all flyers & ticket order forms, using templates from a professional artist. When do we sell tickets? Selling tickets a couple of weeks before the show AND at the door will increase ticket sales significantly. Who collects money and distributes tickets? The PTA/PTO is in charge of handling tickets & collecting funds. It’s usually easier to keep a guest list – then you can simply check people off instead of using paper tickets. What kind of seating do you recommend? I’m flexible, but it’s best to have rows of chairs with kids and parents sitting next to each other. The first row of chairs should ideally be within 3-4 feet of the stage. With very big crowds the seating should be very wide instead of very deep. Is your show guaranteed? YES! My show is guaranteed to be a lot of fun AND to be profitable to your school. Many schools have me every year, and I hope you’ll become a happy repeat customer! For a sharable/printable .pdf on this show, CLICK HERE.